This may shock some of my more recent readers, but there’s something crafty and creative that I like to do more than knitting. I KNOW. Many many years ago (back when Sesame Street was in single digit age), G-ma taught me how to do ceramics. And up until five or six years ago, I did them pretty regularly. I would spend summers with her, and much of our time was spent cleaning greenware, painting, firing her kiln, glazing. 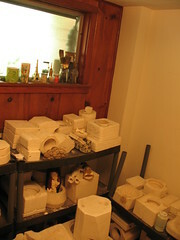 When she had the stroke, she indicated that her kiln and all of her molds were to go to me. 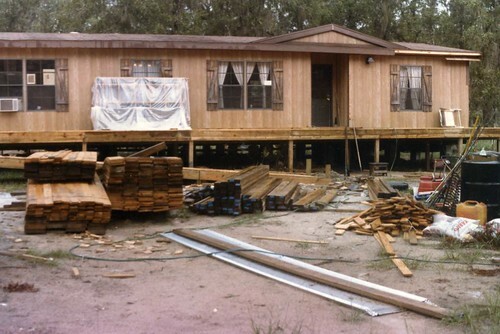 They moved from the house in Merritt Island to the farm, then briefly into storage, then into this house when I bought it. 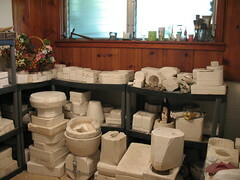 I kept up with doing ceramics, firing the kiln every couple of months or so, until Tim and I got married. The last big thing I did was to make all of the centerpieces for our wedding. After that, we got sidetracked in the house by renovations – power was cut off to where the kiln was, and coupled with the back porch not really having enough room for both my ceramics and Tim’s woodworking… well, renovations took the front seat. 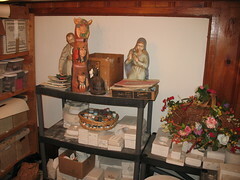 I piled the molds into this tiny stupid room we have – most of them that weren’t in current use were there anyway – and my tools and paints got set aside in various places around the house. The kiln began to gather dust. But I still needed a creative outlet, and thus turned to crochet… and eventually knitting… which led to spinning… and the rest is history. In the back of my heart I still missed ceramics; but it was easier to shut the door on that than it was to find space in the house in which to spread out. Painting takes a while – we didn’t really have a table on which I could paint that was also not cat accessible. Greenware is very fragile, so it should be kept away from nosy curious graceless fat cats (like we have). 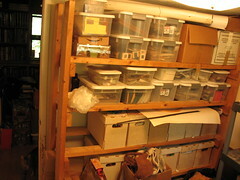 The room in which my molds were stored was this crazy tiny room, really more of a glorified closet, and I also stored my comic books in there, boxes of photographs, and all of my other craft supplies (soap-making, candle-making, chocolate-making, bath salt stuff, scrapbook supplies). I started just tossing things in there when I didn’t know what to do with them. Old gift bags that might be re-used. Boxes for shipping stuff, on those rare occasions I might need to ship something. 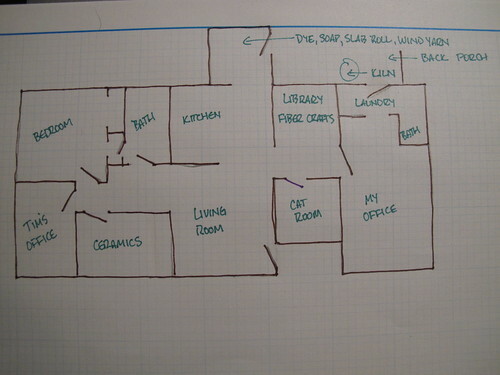 The room became a wreck, and soon I hated to even go in there to look for things. For my birthday a number of years ago, I asked some friends to help me clean it out an organize it. That worked for about a year. Then it was back to the way it was. I suppose if I’d been actively using it as a craft room instead of passively as a crap room, it might have been different. But… no. Lately, the last year or two, I’ve really been missing ceramics. It’s something I did steadily for thirty years – and loved – so how could I just turn my back on it? I kept meaning to go out to my friend Juanita’s ceramic shop and buy some slip, but kept putting it off (I’m only off on Tuesdays, what if she’s not open, I have other things to do, it’s not like I have somewhere to spread out enough to pour anyway). But something happened the week before last that brought it all to a head. Ceramics. You should get back to that. I dream of doing that – so you must get back to it so I can live vicariously through you.